So Blac has confirmed their engagement on her page after showing off this sparkler with the caption YES !...!...! 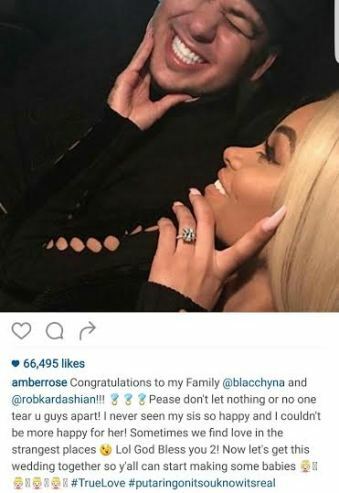 They have also been receiving confirmatory congratulatory messages like this one from Amber Rose.. BUT wait when did they start dating its been only a few weeks or months I think?! AND even though none of the Kardashians/Jenners would have seen this coming am sure they are probably in deep thought on how to somehow scatter this union. Because best believe Blac is the only Authentic Mrs Kardashian cos all the ladies would marry and at some point bear other names likewise the kids they would have except Rob's kids. Like I asked in a previous post,Blac has a son with Tyga who is now with Rob's half sister Kylie. So if Kylie Marries Tyga and they have kids,and Blac marries Rob and they have kids what would be the relationship between Blac and Tyga's kid and Rob and Blac's kids and Tyga and Kylie's kids?? Confusing as hell! Or Maybe this is all just a publicity stunt by them two to get under Rob's sisters Kim,Khloe,Kourtney and their mum's skins?? Ohhh well..Congratulations to the newest couple..